Awesome PoM Car. I came across this one Google picha and just thought it's on of the coolest cars I've ever seen! =D. Wallpaper and background images in the Penguins of Madagascar club tagged: penguins of madagascar skipper kowalski private rico car green. Is This That Magical kisima, chemchemi au Doris's Habitat? OOOOOOOOMMMMMMMGGGGG!!!! THAT'S MY DREAM CAR!!!!!!!!!!!!!!!!!! IT'S AWWWWWWESOOMMME!! WHERE'S THE DUDE THAT OWNS THIS CAR I'MMA MAKE HIM/HER AN OFFER THEY CAN'T REFUSE!!! ^ then that owner will go around asking "dude, where's my car?" You: "Hey isn't that peacebaby7?" *grins* I could put that on my birthday list! :D And drive it around once I leave for college. I would be so cool...well, in my mind, anyway. DWPC: HEY! WHAT THE FREAK ARE YOU DOING WITH MY CAR!? 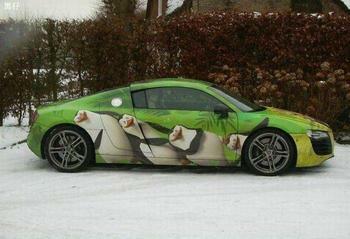 you do know, if you have enough money to buy a car and paint it, you could have something like this. whoa, i'm going to do that... if I somehow come up with that kind of money. Nice car, however, that looks like an Audi. I want that car!!!! *re-awakens* I WANT THAT CAR!!! Even though I can't drive. XD It's the best car EVER!!! I wonder how much that cost! ^It's cool sorry I didn't understand it you sounded serious to me I apologize.